It is undeniable that we Australians have a profound love for sports. As early as childhood, we are already exposed to different kinds of sports which most probably is the contributing factor why many people now participate in national sporting activities. Studies show that 92% of the Australian population have an interest in at least 1 sport and 6.5 million participate in organised sports. Mills Park in Beckenham, Western Australia is a 24 hectare recreational space with high levels of sport and passive recreation use. 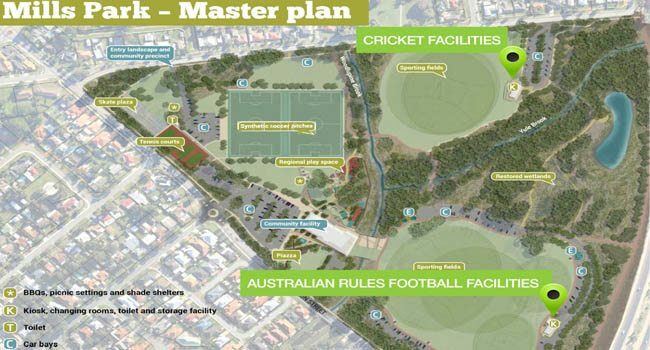 After many years of investigations, consultation, options and design development, the Mills Park Master Plan was finalised in December 2014 (City of Gosnells website 2016). Landmark Products worked in partnership with; 1. Cardno, one of the largest professional infrastructure and environmental service providers, 2. 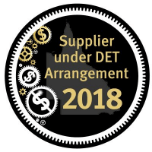 Ertech Pty Ltd the civil contractor responsible for managing the project deliverables and 3. The City of Gosnells council. The Projects first stage of the redevelopment master plan commenced in April 2015. 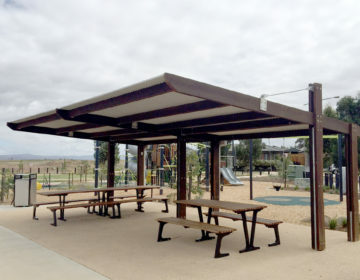 Working closely with Cardno, Ertech and the City of Gosnells, Landmark Products Pty Ltd was selected as the preferred supplier and installer for a large part of the landscape infrastructure products for this project. 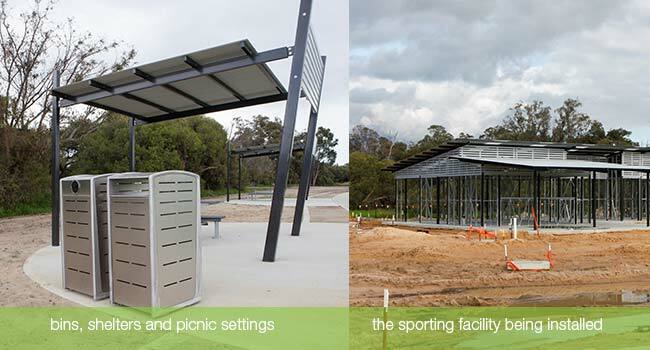 We designed, engineered, supplied and install 2x Multipurpose sports/change room buildings, a restroom, multiple park shelters, picnic settings, skate park shelters , benches, seats, bin enclosures, bike racks, drinking fountains, barbecues and 150m boardwalk with piazza within the whole master plan. 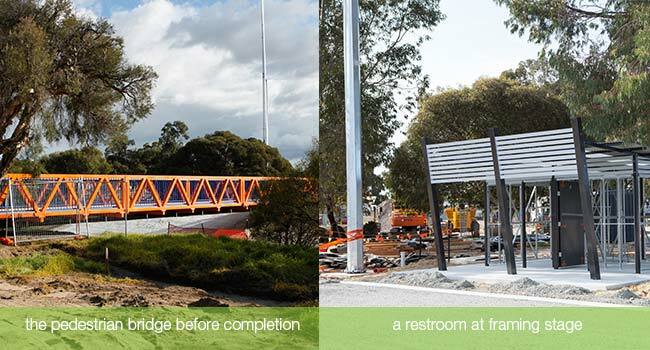 We provided one of our Murray series steel truss pedestrian bridges at 23 metres in length with an inside clear width of 3 metres. This bridge was manufactured in steel and finished with hot dipped galvanising (HDG) and powder coated, fibreglass reinforced plastic (FRP) closed grid decking and aluminium balustrading with integrated handrail and lighting. The restroom carried the same design as for the shelters with through posts and aluminium screens. 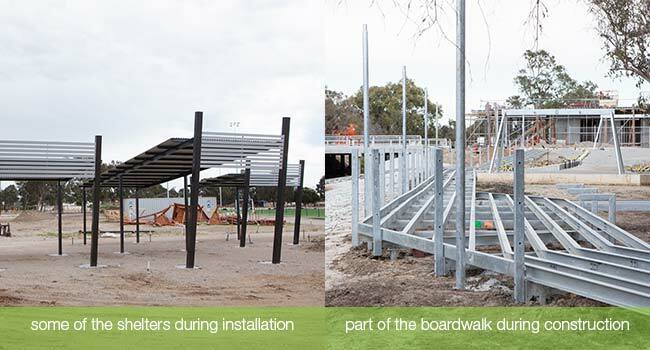 The boardwalks sub structure was manufactured from steel and hot dipped galvanised for a high level of protection. Decking is Einwood wood plastic composite (WPC) and has integrated seating and lighting. The highlight of the master plan for Landmark Products was the change room and sporting facilities. 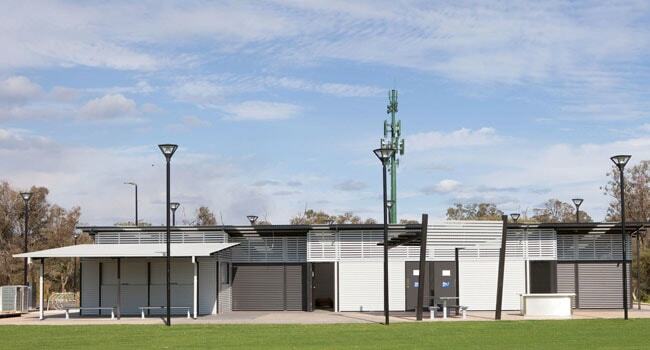 We consulted an architect to help design and achieve the requirements for both facilities, who sort information from AFL Australia, and Cricket facilities manuals from the United Kingdom. We carried out sun modelling paths to consider the design to minimise energy consumption. We also added our comprehensive knowledge of restroom design and CPTED principles which helped deliver a facility that was not only robust but energy efficient that caters for a higher level of female use, which is generally left out from male dominated sports. The Cricket facility has two change rooms, one for the home team and one for the away team. Each change room area has two (2) individual showers and three (3) individual toilet cubicles. There are three (3) hand wash basins in the communal shower/toilet section of this area so they can cater for large team sports and a large area for changing and seating so the coaches can prepare the team. We will show the fit-out details in the next part of this project story. These are all non-gender specific and hence can be easily catered for female teams. 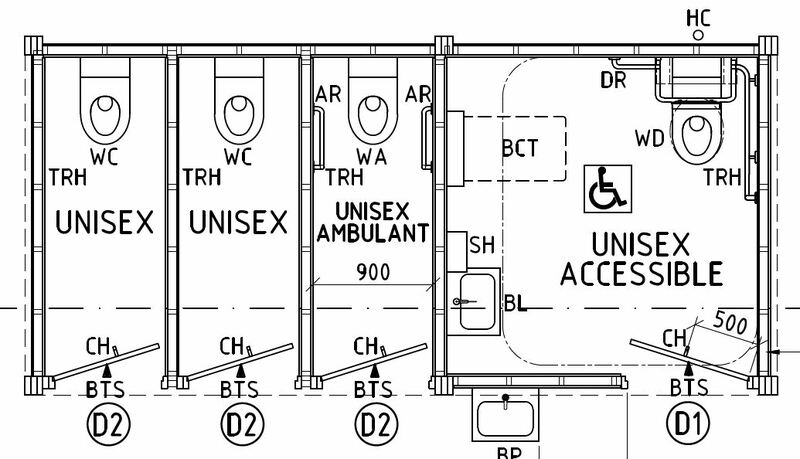 On the front side of the facility and in-between the two change rooms there is access to two (2) unisex accessible cubicles which will provide the parks patrons access to public toilet amenities regardless of gender or ability. A kiosk is adjoining one of the change rooms with its own entrance, this allows the local club to sell food and drinks to those who come to the venue. This is an important part of the whole facility as most local clubs raise the majority of funds from the kiosk. The kiosk has three (3) roller windows for security and easy servery from the kiosk. A grounds store and equipment store lies behind the kiosk. The grounds store is where the huge lawn mowers used for maintaining the pitch and field are being stored while the equipment store is used to keep the sporting goods such as the bats, pads, wickets and balls are kept. We supply in Kit form, this makes the whole building process simple and quick; in fact this portion of the build took less than 2 weeks to complete. The main structural posts were placed in situ and the concrete slab poured. The remainder of the steel framing was then fixed off along with the screen ventilation and roofing sheets. This photo also shows one of the shelters (black posts) that was completed at the same time as the framing stage. Once the framing was complete we were able to start constructing the cladding and doors for the lock up stage. External cladding was Colorbond custom orb. This type of cladding provides durability, easy maintenance and prevents vandalism (CPTED undesirable surface to spray paint on). Colorbond custom orb roof sheeting and clear Wonderglas panels were used for the roofing to allow light in the facility thus reducing the need for lighting during the day time. All doors are timber with ColorBond cladding for higher strength, the servery windows are a roller door style for easy use and security. Lock-up stage took only another week to complete which means only three weeks from starting on site to lock up. 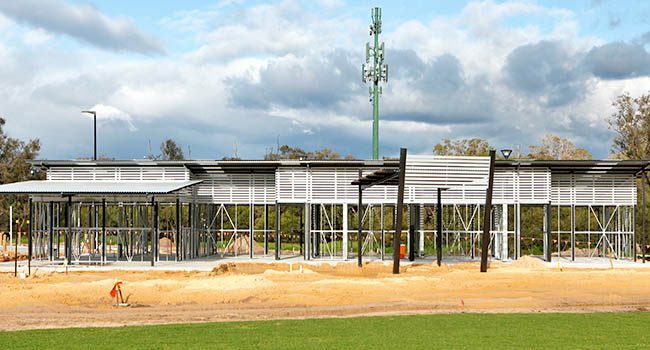 This cricket change room and sporting facility is currently complete, so stay tuned for the second part of the story to see the amazing finished results.